Wondering whether to choose plastic, bamboo, or wood for your chopping surface? Find out which cutting board will offer safest and most efficient meal prep. Interested in keeping your investment countertops in tip-top shape? Cutting boards are key accessories for any kitchen, providing a durable, hygienic place to slice and dice ingredients without marring the beautiful work surface beneath. Available in a range of materials, shapes, and sizes with a handful of features to choose from, they may seem like a dime a dozen, but some are better than others when it comes to how suitable they are for different types of food. If you’re on the lookout for a new cutting board, read on. We’ve outlined exactly what should be considered—from material to design—as well as three of the best cutting boards that combine our wishlist features so that you can find one that’s a cut above the rest. First, narrow down the material. The first thing to think about when you’re in the market for a cutting board is its material. Get to know the differences between the most common types so that you can weigh their pros and cons. Cutting boards made of plastic may seem like the most health-conscious option since they’re dishwasher-safe, but studies show that they may not be as germ-free as we assume. While a brand new one can be completely cleared of bacteria with a run through the dishwasher, even a lightly-used plastic cutting board can never be truly cleaned once knives have compromised the surface. (Even shallow scratches will catch and harbor some.) On the upside, plastic options are slim and easy to store, gentle on knives, and not particularly expensive. 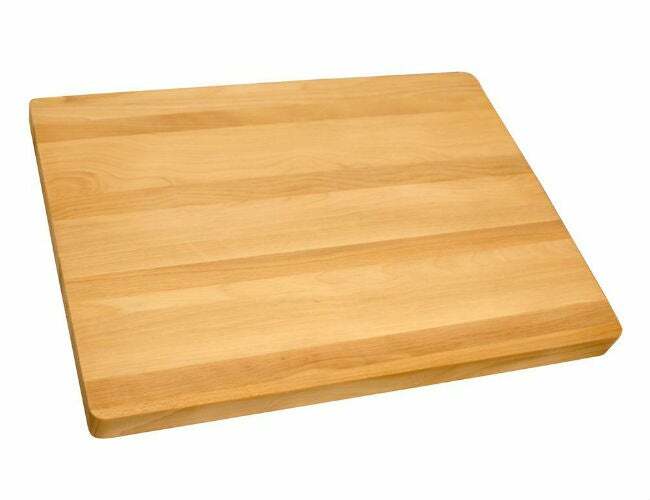 Advice: Plastic options may be the best cutting boards for bread and vegetables if you avoid cutting meat on it and wash all other foods vigorously before chopping, dicing, or mincing them. Even so, you’ll still need to replace it once or more a year to avoid potential foodborne illness. 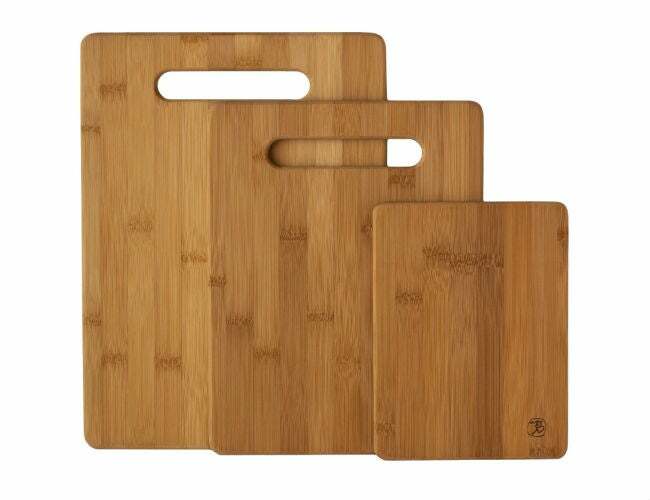 Most bamboo cutting boards are considered to be an eco-friendly choice since they’re made from a sustainably grown material. An additional perk: They offer similar sanitary properties to traditional wood cutting boards (potentially even better, some say, since bamboo boards tend to be less soft and absorbent than wooden counterparts). Just know that you should wash these by hand because your dishwasher’s concentrated heat and water can warm the grass fibers that make up a bamboo board. Advice: While overall cleanliness and environmental consciousness work in its favor, know that bamboo can be particularly hard on knife blades, requiring you to sharpen your blades more often. Least likely to wear down your knife blades, handsomely textured, and available to complement whatever wood finish exists in your kitchen, wood options are quite popular. They aren’t always a clear winner, however, because they are both the priciest and the most “high maintenance” of the bunch: These boards must be washed by hand to prevent warping and require occasional conditioning with a food-grade mineral oil to keep it in great shape. Advice: Whether you prefer a traditional butcher block made of several types of wood or a sleek, heavy slab of maple, know that most wood boards are two to three times as expensive as a bamboo alternative. Still, with the right maintenance, your wooden cutting board can serve double-duty as both work surface and serving platter for generations to come. If you’re a fan of luxury culinary products, you might consider an upscale material like marble or granite. These slabs cost three to four times as much as any other material, however, and are technically more visually appealing than useful. For example, granite is too porous to resist absorption of the foods you set and chop on it; therefore, it may enable cross-contamination even after a thorough cleaning if you were to use it for cutting meat one night and vegetables the next. Advice: Either marble or granite slabs are perfectly safe and strikingly beautiful to use when slicing fruits, cheese, and crudités, but not necessarily practical for day-to-day meal prep. Select the right size and shape for your kitchen. Of course, a cutting board won’t do you much good if it’s too small for the task at hand or too large to fit onto your countertop. (The latter can cause dangerous wobbles if you allow it to hang over the edge while you cut your food!) Most boards’ dimensions range from around 8-by-10 inches to 20-by-30 inches, or even larger. Before you purchase a new one, be sure to measure the area where you’ll be using it and plan for at least a one-inch perimeter around it while you work. 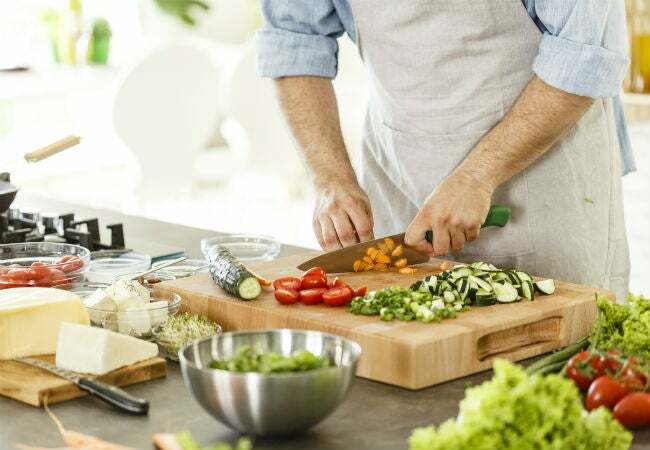 But don’t feel limited to just the one: Many households do well with several cutting boards of various sizes—all smaller than your countertop—with which you can easily divide and conquer food prep tasks between yourself and a sous chef. Many cutting boards are simple rectangular slabs, but a few subtle details can work in your favor to make the chopping process less of a mess. • If you’re on a mission for a bamboo or wood cutting board to use specifically for meat preparation, a trench that runs a half-inch in from the edge all the way around your board can help collect excess juice from running off the board and onto your countertops. • Rubber feet in the corners of your board afford you extra control while you rock your knife back and forth on top. Of course, feet designate one side of the board as the top and the other as the bottom, meaning that you cannot make use of both sides for cutting—when the one gets all carved up, you won’t be able to simply flip the board over to work on the “new” side. Board edges wrapped in rubber, on the other hand, create a similar grippy effect without eating up any space on the face of your board. If you decide to go ahead and skip feet altogether, though, you can still steady the board easily by placing a wet paper towel or a clean rag underneath your board. 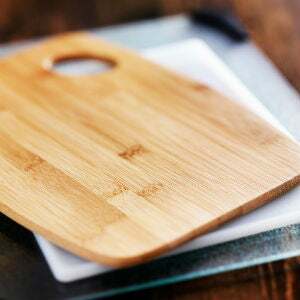 Whether you’ve decided to pursue a plastic, bamboo, or wood option, we’ve rounded up the best cutting board in each material to shave time off of your shopping trip. Not only do these combine some of the most-wanted features outlined above, but each one has been highly ranked by consumers and rated by independent reviewers as the best buys for your money. Home Depot shoppers are big fans of this classic wood cutting board made by Catskill Craftsmen from sustainably harvested Northern hardwood grown in the United States. Reversible and durable, the 1-¼”-thick slab runs 17 by 23 inches, offering plenty of space to cut a handful of produce or several pounds of meat at once. The rectangular board must be hand-washed and should be conditioned with food-grade mineral oil a few times a year if used frequently. Available at The Home Depot. 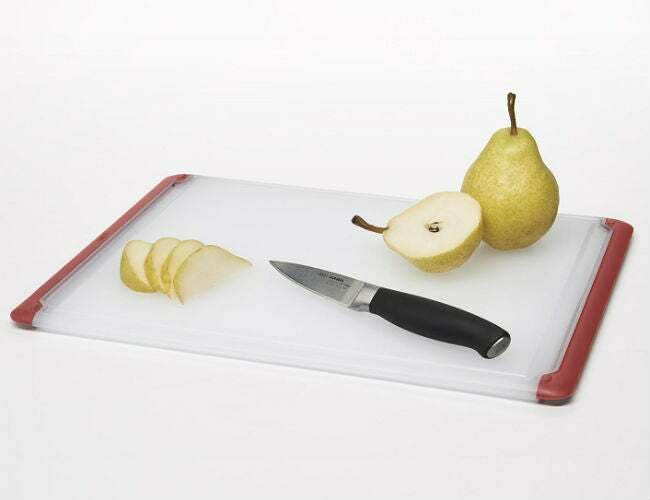 Amazon shoppers can’t get enough of this grooved plastic cutting board from OXO, which received 4.4 out of 5 stars for its dishwasher-safe properties and petite size. The ½”-thick polypropylene board measures 10-½ by 14-½ inches, small enough to slip into most drawers for storage between uses. This lightweight model features nonslip edges (hence the “Good Grips” name), a trench to catch liquids, and tapered handles for easy moving around the kitchen. Plus, its affordable price point means it won’t be hard on your wallet to replace once or twice a year. Available on Amazon. If you’re looking for replacing all of your boards at once, the team at The Spruce deemed this versatile three-piece set to be the best bamboo option on the market. Its three sizes—9-½ by 13 inches, 9-½ by 11 inches, and 6 by 8 inches—allow home chefs to separate sliced meat from chopped produce from finely diced herbs during meal prep. Then, after dinner, the nonabsorbent (i.e., stain-resistant) Moso bamboo surfaces can be easily hand-washed. Together, that winning combination of sustainable sourcing, durability, and natural good looks earned the set 3.7 out of 5 stars from more than 2,700 Amazon reviewers. Available on Amazon.